Unseating Louie Gohmert. Protecting undocumented neighbors. Desegregating Tyler. Local progressives are making no small plans in the age of Trump — but can they work together long enough to win? Protesters with Indivisible of Smith County and other grassroots groups ask Louie Gohmert for a public town hall. Courtesy Lee Hancock. Inside, the congressman had just wrapped up a luncheon with a group of mostly friendly supporters. Like other Republican lawmakers, he was disinclined to give his less-friendly constituents what they wanted: a public town hall to hear their concerns. His getaway car stalled outside while an aide hatched an escape. Finally, a decoy car was summoned and the congressman ran out the back into a private parking lot. The protesters still haven’t gotten face time with their congressman, but he gave them something arguably better: a statement explaining that he can’t meet with them because a public forum would put their lives in danger. Like many of the congressman’s public pronouncements, it was destined to draw national headlines and jeers — and show the world that even in deep East Texas, the resistance has legs. Since the November election, those who voted against Trump, or wish they had, have faced a glaring question: now what? In response, national protests have drawn hundreds of thousands to state capitols, airport terminals, and town squares. New grassroots groups have sprung up in tiny towns and big cities across the country. Websites like Run For Something are teaching people with zero political experience how to run in local elections. Here in Tyler, a city that didn’t see its first civil rights march until 1992, you’d be forgiven for assuming this wave would pass us by. 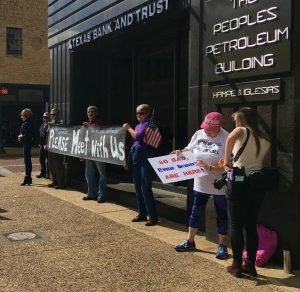 Case in point: the National Women’s March in late January, which drew 2,000 supporters in subzero temperatures in Fairbanks, Alaska, didn’t rouse a single sign in downtown Tyler. But a couple days later, after someone hung white supremacist posters on a local Muslim dentist’s office following Trump’s first attempted Muslim travel ban, hundreds showed up at the East Texas Muslim Society’s mosque with flowers and messages of unity. And the first weekend in March, half a dozen events across Tyler were organized and attended by around 300 East Texans who — perhaps quietly — tend to vote Democrat, identify as liberal or progressive, or want more public dialogue about issues of inclusion and identity in our region. There was a vigil for victims of transgender violence, a “postcard party” to write letters to Republican lawmakers over brisket and beer, a panel on women’s health care with a speaker from Planned Parenthood, a pep talk by famed progressive writer Jim Hightower, a show of support for an public art display that many believe was a target of racial discrimination, and a daylong gathering of East Texas Democrats that drew attendees from as far as Texarkana and Bowie County. “It was remarkable,” says Lee Hancock, a Tyler resident of over 20 years who formerly covered East Texas for the Dallas Morning News. 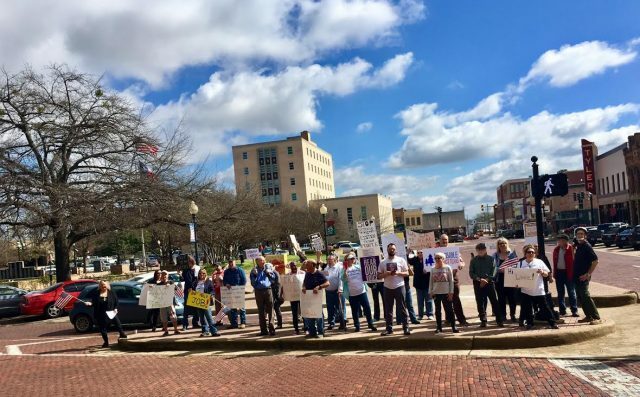 Hancock is now a lead organizer with Indivisible of Smith County, one of several new progressive grassroots groups in the region, including Indivisible chapters in Lufkin, Marshall, and Nagodoches. Her group organized the showdown with Gohmert and a mid-March rally at senators Ted Cruz and John Cornyn’s offices against the Republican health care bill. Nearly 400 people follow the group’s public Facebook feed. “There’s so many options be with people who share your values and concerns and feel like, hey, maybe I’m not the only one,” says Hancock. The grassroots groups behind such events, some formed since the election, some much earlier, reflect a diversity of causes. There’s the local chapter of Our Revolution, “the next step of the Bernie Sanders movement,” which has a member in Nagodoches running for a county commissioner seat. The Snowflakes, a Longview-based coalition of young folks who lean socialist, galvanized after white supremacist posters popped up in Tyler. Voices of East Texas, a nonpartisan group, has organized informational panels on the local impacts of national policy proposals, including a repeal of Obamacare. And, of course, there’s the local Democratic Party, which recently held a summit on “turning East Texas blue” that invited leaders of the new groups in town to introduce themselves to the party faithful. 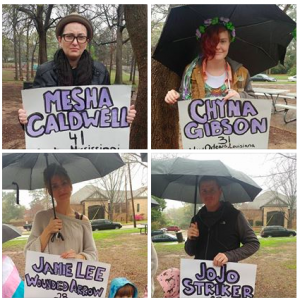 A new subgroup, Democratic Women of East Texas, organized a bus to Austin for the Women’s March. Louie Gohmert has painted post-election protesters as paid “outsiders.” I talked to nearly two dozen actively progressive East Texans for this story, and they’ve all lived here for years, even decades. None are being paid for this work. Some have a depth of experience organizing in Smith County. Others seem surprised to find themselves at activist meetings and gripping signs on sidewalks; in this deeply conservative swath of a deeply conservative state, they’ve long kept their politics to themselves. Several said publicizing their political concerns, whether at a downtown rally or a work party or on one’s personal Facebook page, comes with risks. They worry about getting fired or passed over for promotions. Their kids not getting invited to sleepover and parties. Old friends at church or book club acting like distant acquaintances. Some are even concerned for their personal safety. 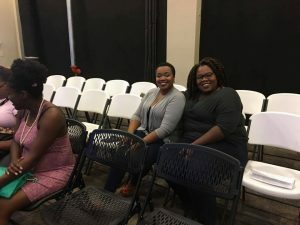 Erricka Bailey, 27, co-founded My African-American Mothers’ Alliance, or MAAMA, early last year to draw attention to race-based health disparities in East Texas. Bailey says that after a couple MAAMA events, she heard people revving their car engines outside her home at night, or making noise and running away. She believes these were attempts to intimidate her for talking openly about race in Tyler. “Some people are unhappy with what we’re doing,” she says. So what are newly emboldened progressive East Texans fighting for? The bucket list varies widely: the demise of Louie Gohmert’s political career, the stamping out of white supremacy, capturing local school boards and council seats, keeping undocumented loved ones out of detention centers, protecting transgender school kids, desegregating housing in Tyler, safeguarding East Texas mosques and synagogues, defending the Affordable Care Act, bringing back manufacturing jobs, and a dozen other items. In a way, that progressive-palooza weekend in early March — the multitude of events to choose from, some at the same time and drawing notably different crowds by age and race — points to the biggest challenge: achieving the local unity it’ll take to move the needle on any one of these issues, even by a hair. So far, events organized by local outposts of new national movements like Our Revolution and Indivisible have attracted impressive numbers of older white supporters, and far less of anyone else. And that’s a problem: there simply aren’t enough left-leaning retirement-age white folks in East Texas to make a dent at the ballot box. Lee Hancock, a lead organizer with Indivisible of Smith County, say her group takes inclusion seriously and wants its membership to better match the county’s demographics. “We recognize that we have to do more,” she says. “We invite everyone with a sincere desire to work together on our shared goals to join us and to help us educate ourselves on the issues that they’re most concerned and passionate about.” The group is organizing a voter registration push to “do all we can to ensure equal access to the ballot box for all,” she says. None of these issues is unique to East Texas. Across the country, progressives left stunned by Trump’s victory are wrestling with a daunting political reality. While the share of the population held by reliably conservative voters is shrinking, Trump’s victory proves it’s still the biggest and most cohesive voting bloc. In huge swaths of the country, the left can’t capture the mayor’s office without forming diverse coalitions, let alone the statehouse or the White House. That means grassroots leaders have to get people who might otherwise never cross paths — the socially conservative undocumented Latina mom, the fiscally conservative retired white doctor with a gay son, the atheist non-binary black college student — working together against a common enemy. As prior generations of progressives have discovered, that road is full of landmines if you don’t have a map. Make it to the other side, and you can hit the jackpot, says Max Krochmal, professor at Texas Christian University in Fort Worth and author of the new book Blue Texas: The Making of a Multicultural Democratic Coalition in the Civil Rights Era. It looks at what happened across when black laborers, Mexican-American activists, and white liberals in Texas figured out how to work together in the 1960s. They did things that today seem inconceivable in the Lone Star State. They sent a radical environmentalist to the U.S. Senate — twice. They organized massive voter registration drives that changed the face of Texas politics forever. They helped launch the Chicano movement, take on Jim Crow and Juan Crow, and push through the Civil Rights Act. Krochmal says the genius of the group, which called itself the Democratic Coalition, was in squarely confronting their differences, not shying away or pretending they didn’t exist. Openly talking and even arguing about everything from seniority and political bona fides to race and identity bred cohesion. He wants progressives in Texas and beyond to study the Coalition — how they picked their leaders, how they set up their meetings, how they recruited, how they shared the mic — as a blueprint for cementing their own diverse alliances in the age of Trump. “They left work that remains to be done today,” he says. It remains to be seen whether these progressive ripples in East Texas will pool into a wave that transforms the region, or bump into each other and melt away. There is, however, one thing nearly everyone I spoke to for this story has in common, whether atheist or worshipper, queer or straight, of-color or white, Baby Boomer or millennial, lifelong resident of the piney woods or transplanted UT grad. They use different words to express it, but they all want to rewrite our ideas of who “belongs” in East Texas and what East Texans are willing to fight for. Not a bad place to start. We want to hear your thoughts on the challenges facing East Texas progressives today — drop us a line at hello@thetylerloop.com.